Cruise ship anchored near Spring Point Ledge Lighthouse, Portland, Maine. Imagine gazing down from the deck of a luxurious cruise ship at a pod of humpback whales frolicking in the water below. As you sip a hand-mixed cocktail in anticipation of the gourmet meal to come, you think back on the trip’s many sights: Tours of local wineries in Portland, a 1,700-pound chocolate moose in Freeport, a lobster-flavored ice cream cone in Bar Harbor. From Kennebunkport to Eastport and north to the Canadian Maritimes, cruise trip travel off the coast of Maine offers a range of sights and activities, from wildlife viewing to cultural and historical attractions. Maine is renowned for its rugged, natural beauty, and nowhere is this more evident than along its 3,478 miles of shoreline. From the rocky shoals and pristine forests of Acadia National Park to the more-than 60 lighthouses keeping its shore’s safe, a cruise provides photo opportunities galore. But scenery isn’t all this region has to offer. From late spring to early fall, cruisers are likely to spot minke, humpback, orca, pilot, right, sei, sperm and even 80-foot-long fin whales, as well as seals, dolphins and many species of seabirds. If you’re lucky, you might even catch a glimpse of a horned narwhal. Later in the autumn, cruisers can enjoy one of New England’s most famous sights –stunning red, orange and golden fall foliage. If your cruise is on the southern half of the Maine coast you’ll usually see the most colorful foliage in the third week of October, while mid-coast and Downeast cruises will hit the foliage peak during the second and third weeks of the month. With 12 Maine ports of call to visit, cruisers can explore a wide range of attractions, from the historic 18th century homes at Eastport to the artistic and culinary centers of Bar Harbor, the golfing and walking trails of Camden to the vibrant metropolitan neighborhoods of Portland. Cruises range from just a few nights to several weeks. Prices vary by line, from a few hundred to several thousand dollars. For instance, as of 2012, a 10-day cruise with Seabourn ranges from $5,000 to $13,000, while a four-day cruise with Carnival ranges from $250 to $1,000. 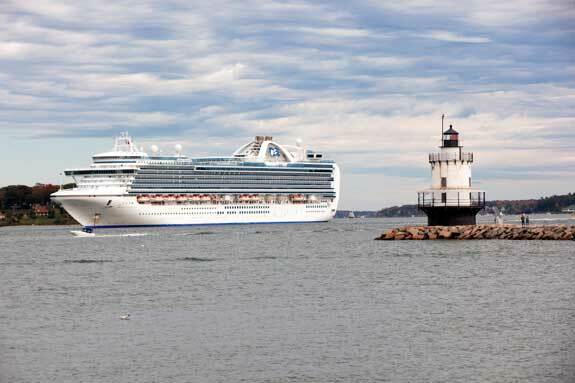 Choosing which Maine cruise to take may represent the most difficult decision of your trip. If you want the big-ship experience, lines like Princess and Royal Caribbean sail some of their largest vessels in the region. In contrast, lines like Silversea and Seabourn tend to sail smaller ships off the Maine and Canadian coast. If your cruise enters Canadian waters, bring your passport. Though closed-loop cruise passengers — cruises that leave and return to the same port – can re-enter the U.S. with a government-issued I.D. or birth certificate, it’s wise to bring your passport anyway, in case you have to take an emergency flight.